Farming Simulator commits to esports with the Farming Simulator League. After testing the waters in 2018 with the first season of the Farming Simulator Championship, the most complete Farming Simulator experience ever is ready to dive deeper into the world of esports! GIANTS Software is proud to announce the upcoming season two and the creation of the Farming Simulator League, a fully-fledged esports league with 10 tournaments across Europe. At the end of the season, the best teams will compete for the title of the Farming Simulator Champion and €100,000 in prizes. Every single tournament will not only grant circuit points for the best teams, but also wield big prizes, bringing the total prize pool for season two up to €250,000. GIANTS Software has teamed up with some of the industry’s finest for the upcoming league, partnering with Logitech G, Intel, noblechairs as well as long term partner Nitrado to provide the best experience possible to both players and fans of the Farming Simulator League. The game itself is changing as well. Not only will the new league be held for the first time on Farming Simulator 19, but it will also move from bale stacking to a competitive 3 vs 3 mode where teams challenge each other to determine who is the best on the field. The game will, of course, stand true to its roots in farming and combine real field work like harvesting with fun and challenging game elements. This is just the beginning, so stay tuned for more information about the new Farming Simulator League in the months ahead. The multimillion-selling franchise takes a giant leap forward for 2018 – the ultimate farming simulation returns this year with a complete overhaul of the graphics engine, offering the most striking and immersive visuals and effects, along with the deepest and most complete farming experience ever on consoles and PC. 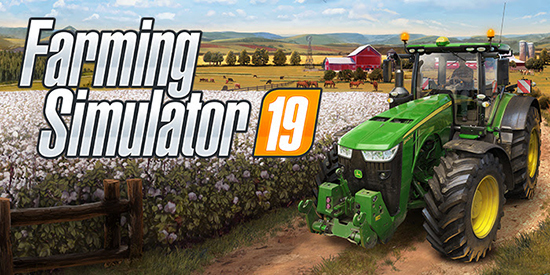 Farming Simulator 19 is the richest and most complete farming experience ever made for consoles and PCs, releasing at the end of the year!